As I was reading The Day-Glo Brothers, there was one passage that particularly caught my eye. "After Joe got married in 1938, he and his wife, Elise, moved into a run-down old farmhouse so that he would have room for his own laboratory." On the following page, we learn that soon after, they figured out how to make lightfast Day-Glo pigments. 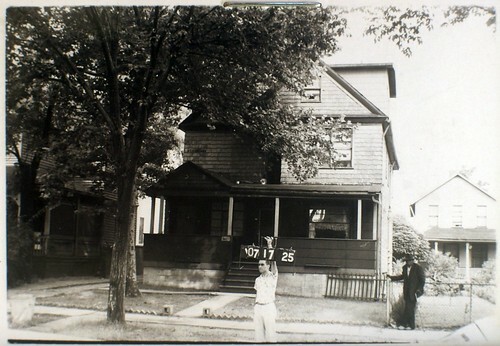 A house in Cleveland where an important invention occurred? I had to find it! I searched the County Recorder's property records, but the first one I could find for Joseph Switzer was in 1941. 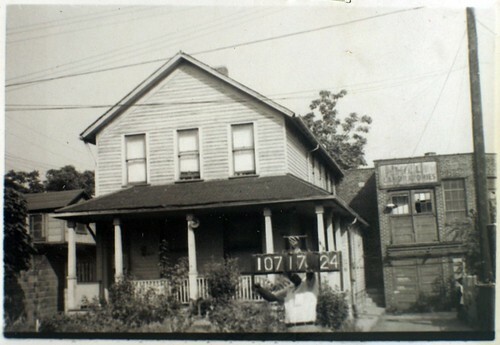 In that year, he moved to 1003 Elbon Road, a new house, in Cleveland Heights, presumably as a result of the success of his invention. I checked some other sources, without any luck. Finally, I emailed the author of The Day-Glo Brothers, Chris Barton, who was quite helpful provided me with contact information that I would need to find the answer. After sending off an email, something occurred to me - why not check the most obvious source - city directories for the years in question! I called the History and Geography Department at Cleveland Public Library. In a matter of minutes, the librarian informed me that, in 1939 and 1940, the address for Joseph Switzer was listed as 1592 Crawford Road. A quick check indicated that whatever house had been at that address was no longer standing. I was pretty sure that that area was covered in the set of photos of Hough that I'd digitized from property cards in the Cuyahoga County Archives. I couldn't find the address among the group. I was suspicious about the presence of a structure described as a "farmhouse" in that area, though I shouldn't have been - Crawford Road has been in place since before 1852. I searched Sanborn Fire Insurance Maps for Ohio, a database provided through Cleveland Public Library, using the closest cross streets. In this detail of the resuling page, Crawford Road is not labeled. The house at 1592 is sited considerably further from the road than the neighboring houses, consistent with a house built before the rest of the neighborhood. With this image showing the outline of the houses, I started looking at the property card photos again. I had been able to verify that this parcel, 107-17-027, was 1600 Crawford Road. A small part of the house in parcel 107-17-025 can be seen in the preceding photo, and vice versa. Further, it is consistent with the shape of the house shown on the map at 1598 Crawford. To the right, we can see a house sited far back from the road - 1592 Crawford! This is parcel 107-17-024 - 1592 Crawford Road. While we can't see the neighbor's houses, it is clearly the same house that we can see part of in the photo of 1598 Crawford. Additionally, it matches exactly the footprint shown on the map. It could definitely be desribed as a "run-down old farmhouse". I can't be more sure of a date of construction than the 1850s, 1860s, or 1870s - and probably more likely the more recent end of that string of dates. 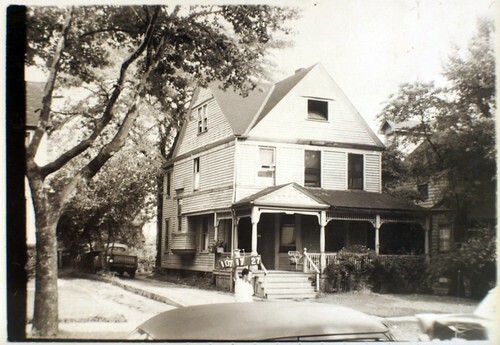 Fred E. Switzer was kind enough to provide this bit of an oral history, recorded by Elise Switzer in 1991, describing the house and their decision to rent it. "At a certain point when it was really bad Joe, and Bob wanted to have the lab work, where Joe was inventing stuff, separate from the Continental Lithograph Company and Forbes Ink so that they could claim shop rights, or something like that. There was an old house on Crawford Road; it was a terrible old house." She does on to describe the exterior, saying "The last time it had been painted was fifty years before, and they had painted it silver, if you can imagine. I mean aluminum." I was hoping, had the house been standing, to see if we could have it painted in Day-Glo colors, to commemorate Switzer's invention. Perhaps that would have been taking things a bit over the top. This brings to light the fact that we need to work now more than ever to identify where the important discoveries and ideas in our city actually occurred, and to document and preserve them. If the houses in the two preceding photos were odd-numbered, 025 and 027, why would the next house on the block be even-numbered--024? Parcel numbers tend to be sequential - though a given sequence may not even cover half of one side of a block. Parcel numbers are changed when there lot is split up, usually, though the exact criteria and method remain unclear to me. 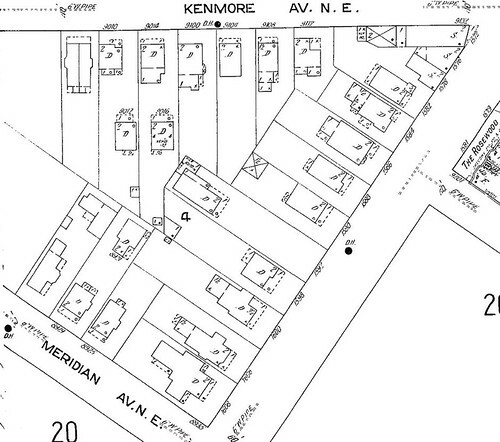 Further, the three houses in the other direction (1590, 1588, and 1586 Crawford Road retain sequential parcel numbers.